Don’t say I didn’t warn you about autumn posts because I did. So here’s my second one! The clocks went back today, so we had a bit of a lie in. Roz spent the night at my sister’s meaning we rolled out of bed at around ten, even with teh clocks rolling back. I’ve been fighting a cold this last week and feeling very sorry for poor sick little ol’ me, and it was good to have a morning when I woke up snot and migraine free. Lovely, I hear you say. Yes. Yes it was. We got Roz and were back home at 1 and as per usual, I logged onto facebook and went into one of my groups. 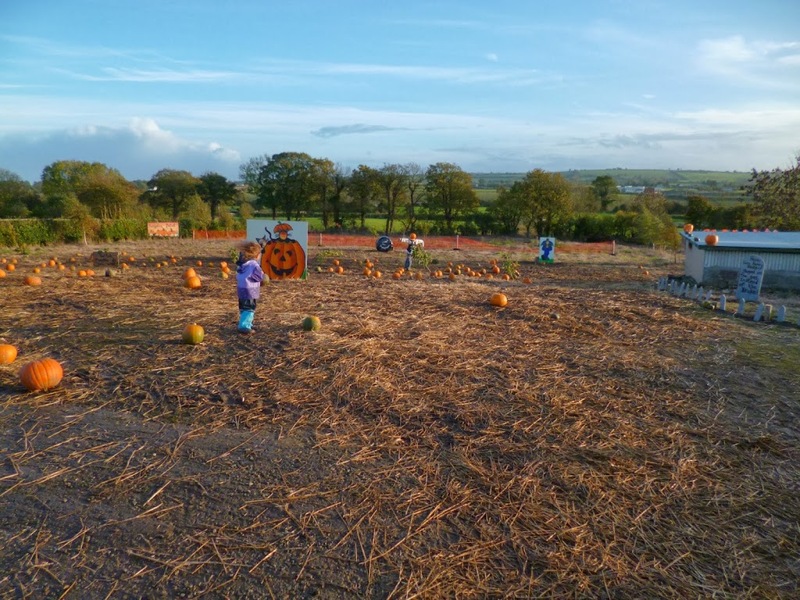 well, I saw a post about a pumpkin patch and nearly screamed in delight. What can be more autumnal than pumpkin? I mean apart from golden leaves, fireplaces, all hallow’s eve, candles everywhere…well, nothing right? And this year I find myself more and more excited at the prospect of Autumn than ever before. I want to make a jack o’ lantern and use all the scooped out bits to make pumpkin pie and roast the seeds for Krys and Roz (hell, I ain’t eatin’ no birdseed) to eat And oh my ays it’s going to be so exciting. Anyhoo, I told Chris there was a pumpkin patch about an hour away and could we go? I didn’t want to drive, so I already had a big speech prepared as to why it would be great if he came with us, but he said yes immediately. We packed up snack and drinks in record time and were in the car and on our way before Roz could figure out what was happening. A small hiccup because she hates being in the car for any longer than ten minutes. Believe me, it used to be much, much worse but she’s growing out of her hatred and I only had to sing “do you know the pumpkin man” (substituting muffin for pumpkin of course) about twenty times before she told me to be quiet. We got a lot of I want to get out mummy. please mummy can I get out, but no actual wailing so that’s a good car ride considering past experiences. Believe me. And it was great. 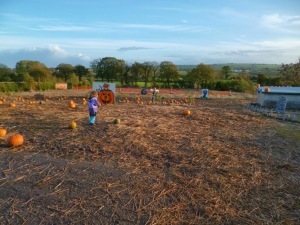 It’s called Kennedy’s pumpkin patch and I have to say that it was fab. 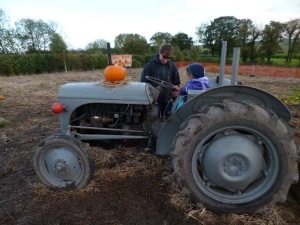 Small, as most places in Ireland tend to be, but Roz ran herself tired and had a great time getting her face painted and eating apples and cheese in the hales of straw and picking up pumpkins and sitting on the tractor and getting a ride on the little wagons and…you get the picture, right? It was perfect and just what I needed on such a miserable wet and cold day. So now the child is asleep, I am warm and getting ready to sit with my cup of coffee and watch a movie, and will leave you with a few pictures of our lovely day. On the tractor, which she loved and felt very grown up on. She didn’t like it all that much the first time and wanted to get off straight away. She loved all the pumpkins and wanted to bring them all home. This looks like great fun. I didn’t know these places existed. I think I’d love it and could take a couple of my kids as an excuse! It was really nice and had a homely feel about it. And they gave out free teas, coffees and hot chocolate too. definitely take the kids All the ones who were there had great fun. you should! I think there’s one in south dublin somewhere on the Enniskillen road. 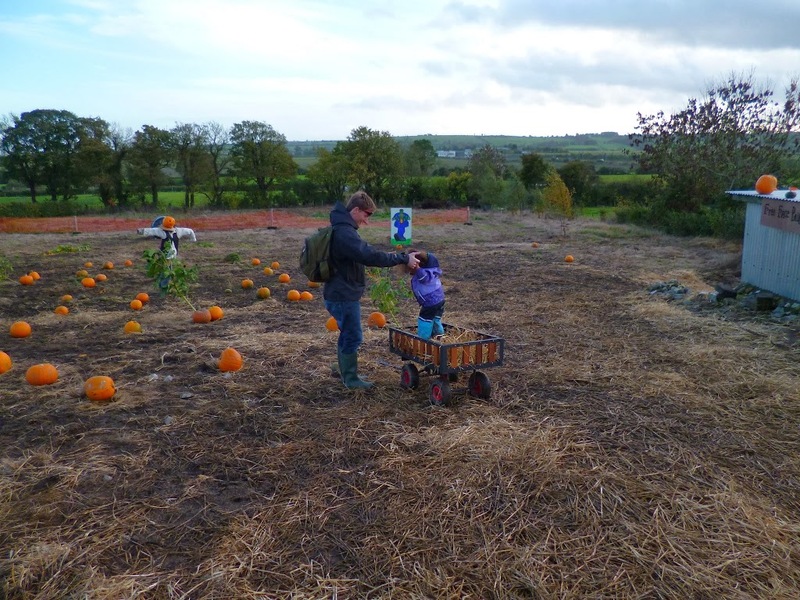 Love this Muuka, wonder if there are any pumpkin patches near me. Sounds like a lovely family day out! I highly recommend it. and there are a few patches around and it was really fun. Thanks for the review!! Delighted that you enjoyed yourselves. 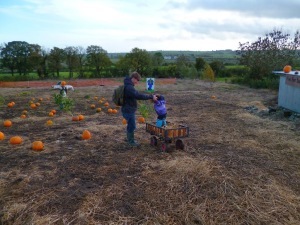 Few months rest and we’ll be out planting for next year. We really did have a great time! It’s a pity I only noticed the “no texting while flying” witch as we were pulling out. It gave me such a good laugh and I’d have loved to put a picture up. Previous story Of Chestnuts and conkers and everything Autumn.